Jackie Fo: A Bean Party! 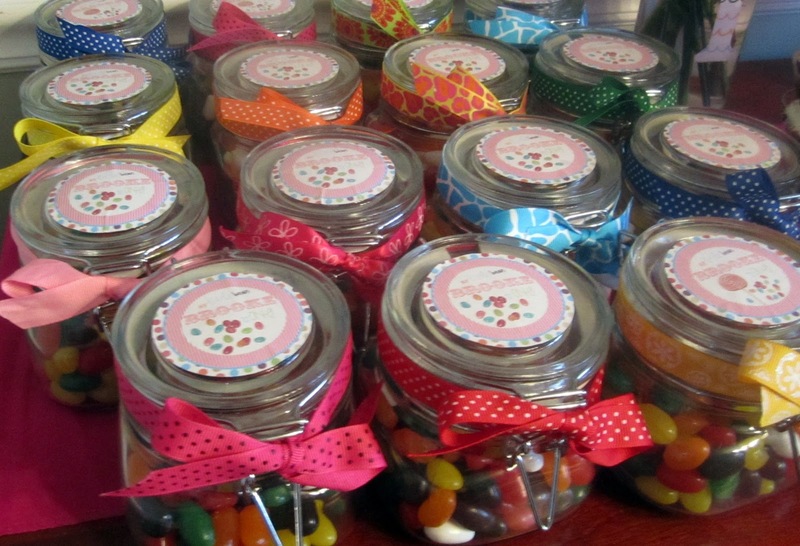 To celebrate my niece's birthday, my sister-in-law (Drew) and brother in-law (Michael) threw a fun, whimsical "Bean Party." Why Bean, you ask? 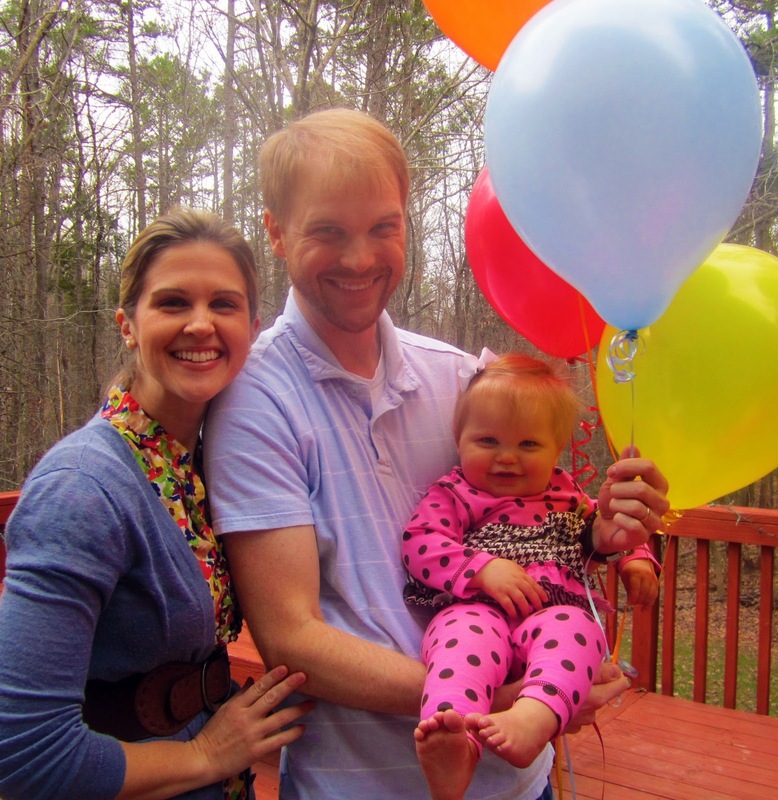 Well, when little miss brookie was an infant, they swaddled her like a bean burrito. Hence, the name Bean. Brooke probably thinks her name is Bean, considering how often she gets called it! Bean, Brooke, Brookie or B- it doesn't matter what you call her! She is the most precious little doll ever! 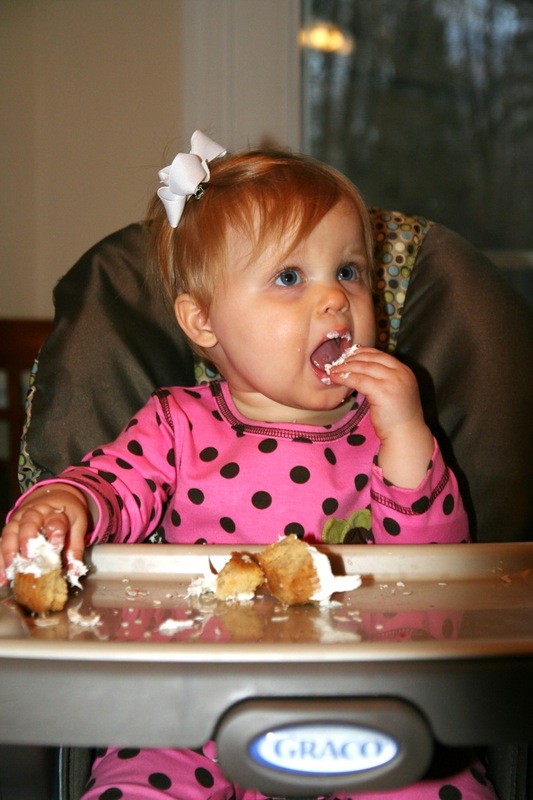 Let's check out her adorable Bean party, shall we? Drew asked me to do a party package for this party to get her going on some ideas...I sent her a package that had everything bean! 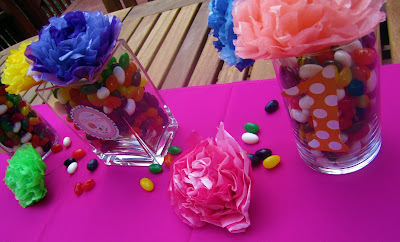 The cutest type of bean by far was Jelly Beans, and that provided a bright and colorful backdrop to the party! I want to give all the credit for the adorable-ness to Drewbie who was super creative and threw a fabulous party for her daughter. You go girl. To kick off the party right, Drew used my favorite party gal, Jess from Party Box Design. 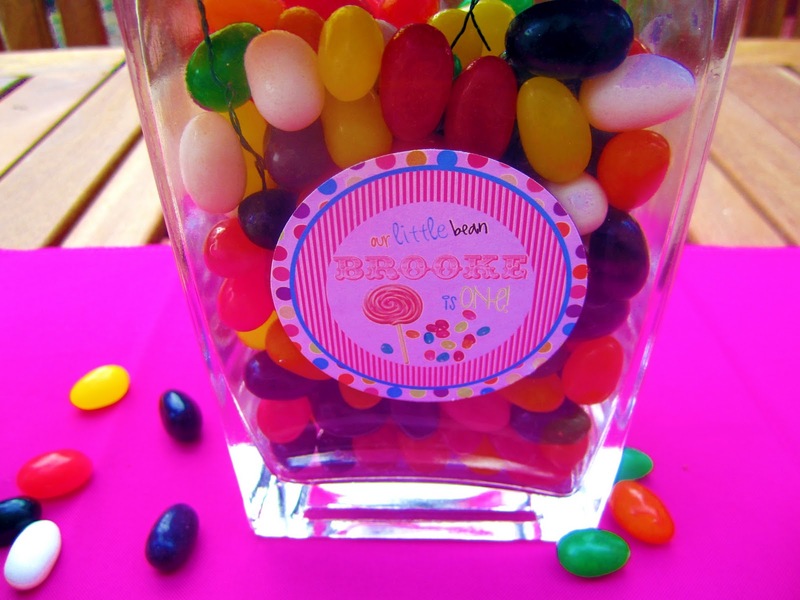 Jess designed invites and matching stickers for this jelly bean party! 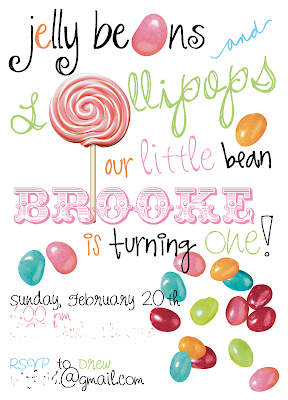 The invitation is below, and you will see the matching stickers in the rest of the pictures....Jess worked her magic again with this one, it's perfect for a little girl's birthday party! Check out her party supplies at her WEBSITE and follow her on her BLOG! Drew totally got her craft on and painted these letters for the front door sign - a great way to welcome guests to all the bean festivities! 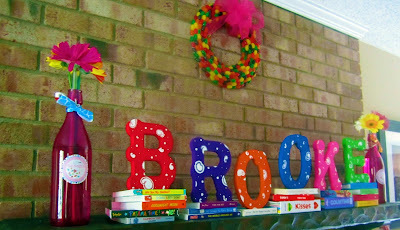 More painting and crafting with some Brooke letters on the mantel...I love how the letters are stacked up on children's books! So precious! 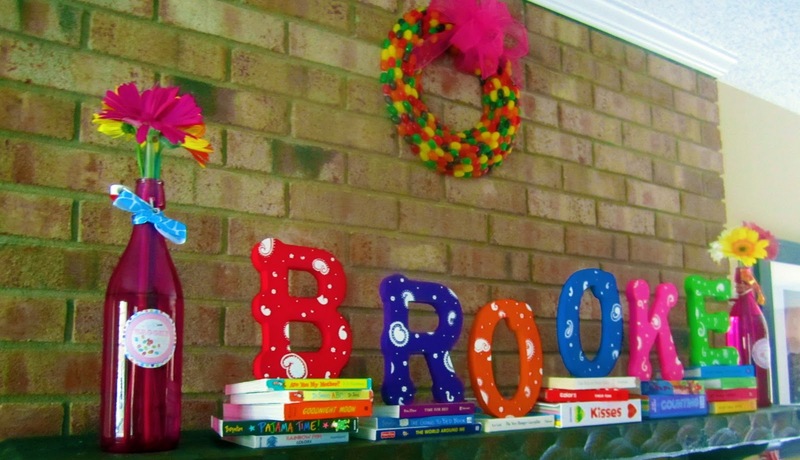 Did you notice the jelly bean wreath above the "Brooke" letters? Oh yes, that is made from real jelly beans painstakingly placed by Drew herself with a hot glue gun. Seriously...a girl after my own heart! Find the wreath tutorial HERE. 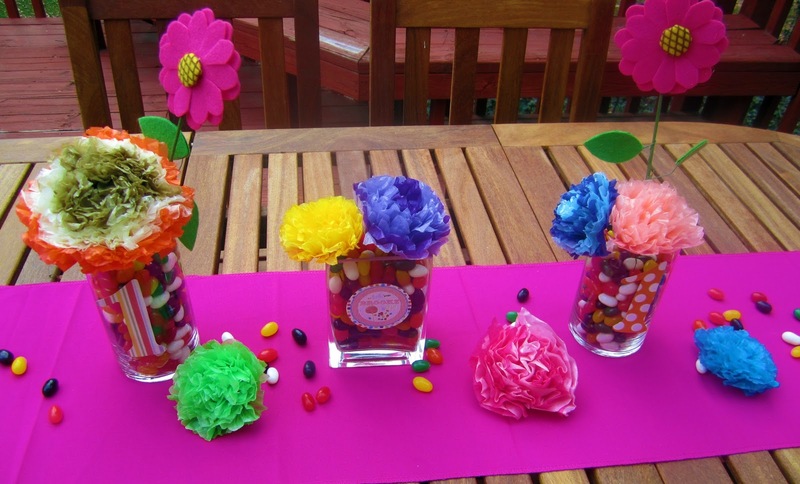 Drew filled vases with jelly beans and flowers (real and tissue paper) for great pops of color. 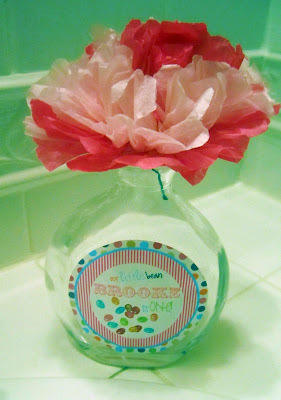 Party Box stickers were also used to decorate the vases, as were "1s" cut out of pretty scrapbook paper. Let's talk about food! In my party package, I gave Drew some bean themed appetizer ideas such as Edamame, Bean Bruschetta and Bean Dip. They all ended up in "Bean Corner." How cute! Cute jelly bean cupcakes were a hit with kids and adults. ...and on the adorable favors - mason jars filled with jelly beans and tied with ribbon. Here's Brookie in the middle of all her presents ...she's such a lucky little girl! In fact, she already looks bored by the new gifts....or maybe she is just overwhelmed as she watches her house quickly turn into a day care/FAO Shwartz. And a full outfit shot - check out this cuteness that Brooke's great grandmother gave her to wear for her party! What an adorable party! 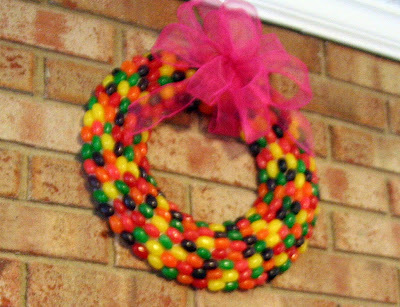 I DID notice the jelly bean wreath before you pointed it out--that is such a cute idea! 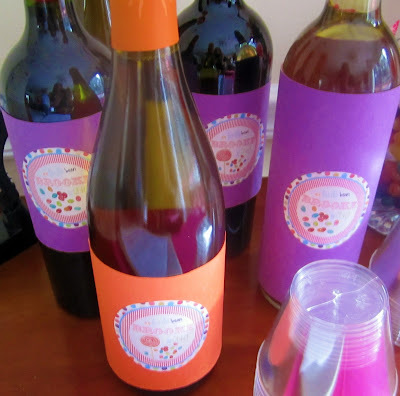 I especially love the invitations and the way the theme was carried throughout. Happy birthday Brookie-Bean! SO CUTE! I love the colors and that bean wreath is just adorable!! Couldn't have done it without Jackie's expertise! She's the perfect party planner, auntie, sister, and friend. What else can a girl (in need of party advise!) ask for? Love you, Jackie! This is such a fun Birthday party idea! 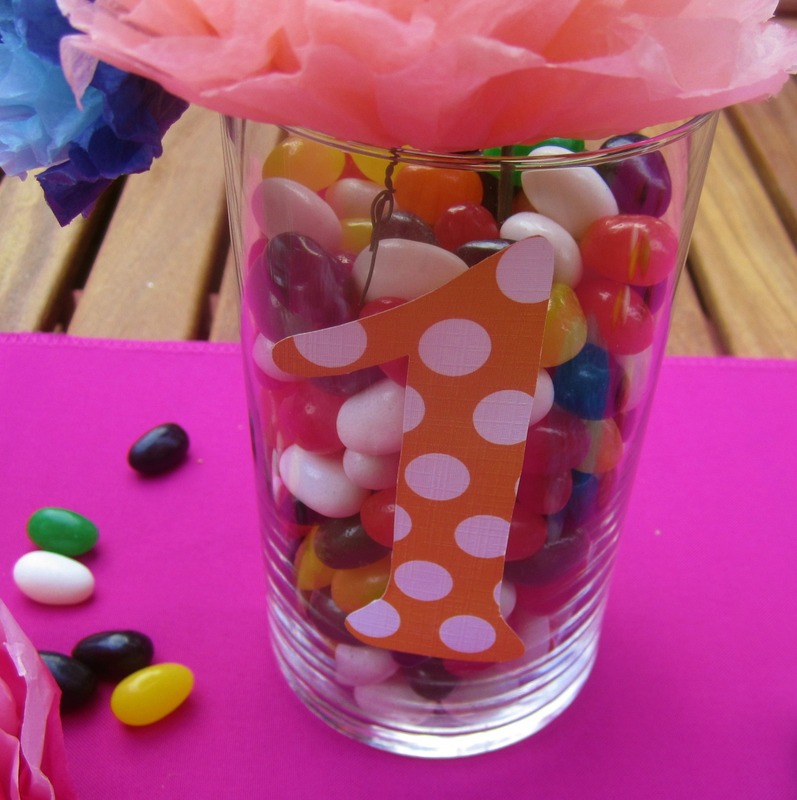 The jelly bean wreath is adorable. Your niece is the cutest! I love this idea of jelly beans! too cute! And Drew did a great job w/ the invites and stickers. Love the wreath! Cute baby i like very much. hey baby happy birthday to you. There are many types of breast cancer, but two are more common in most women. They generally are named after the parts in the breast in which they start occurring. The first is ductal carcinoma and the second is lobular carcinoma. Those two are the most common types, and they appear in the breast's milk ducts or the milk-producing glands.